California is yet, in the news again for another “first” when it comes to marijuana. The state now allows marijuana users to smoke the herb in marijuana dispensaries with specially designed lounges. This is one of the many developments that have followed the legalization of recreational weed in the state, a process that caused a whole lot of political excitement. California is the only state that permits marijuana smoking at marijuana retailers lounges, but it also allows cities to ban those kinds of shops. 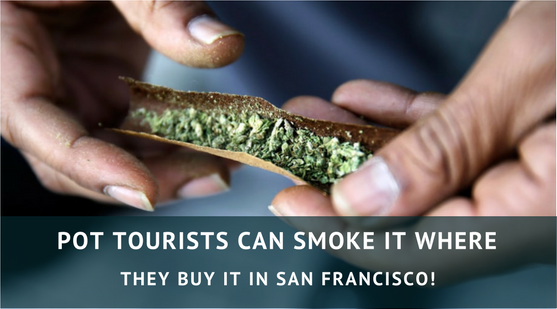 And as you would expect, San Francisco blazed the trail and other California cities are warming up to the idea. The Barbary Coast secured its state license in January, 2018. The marijuana dispensary initially opened as a small medical dispensary in 2013. It carried out an expansion and opened its smoking lounge to users of medical marijuana last year. On Jan. 11, of this year, the dispensary to all adults when it received its California recreational use license. The issuance of recreational use licenses started from Jan. 1 in California. And the state has continued to approve dozens of applications since when it became fully legal. This is because voters broadly legalized the use and sale of marijuana. There are indications that new permits will be issued once San Francisco’s health officials finalize regulations designed to protect workers from secondhand smoke, and the neighborhood from unwelcomed odors. West Hollywood city has approved plans to issue up to eight licenses; the San Francisco Bay Area town of Alameda will issue two; and Oakland and South Lake Tahoe have one lounge each. Sacramento, Los Angeles and other cities are discussing the issue but have not made any categorical statements concerning the authorization of such outfits. Before being granted licenses, it will be required for the lounges to install a top quality heating mechanism, ventilation and air conditioning systems to manage the distinct odor of smoked cannabis and to prevent it from leaking outside. It is speculated that smoking lounges will be set up like traditional bars, but presently, the idea appears to be more of a concept rather than an actual plan. As trivial as it may appear, the situation causes a lot of concern for both medical and recreational marijuana users, especially when they have to smoke their pot in places other than their rooms or private spaces. Many marijuana enthusiasts are finding it easier to buy pot but harder to find legal places to smoke it. Atlantic City resident, Rick Thompson said with a big smile, “There’s nothing like this in Jersey.” Thompson who traveled to Oakland from Atlantic City to celebrate his 27th birthday together with his cousins decided to do it in style, by getting as high as they could in San Francisco. Are other States going to follow suit? Massachusetts marijuana regulators are considering the approval of “cannabis cafes.” But the proposal was scornfully criticized by Republican Gov. Charlie Baker’s administration and law enforcement officials, who among other things argued that opening allowing such businesses to operate would increase the risk of more dangerously stoned drivers on the plying the highways. The five-member Cannabis Control Commission ultimately succumbed to pressure by agreeing to put off a decision on licensing any cafes until after the initial rollout of retail marijuana operations which is expected to happen this summer. Panel members, however, continue to support the idea. Colorado was one of the first states to broadly legalize medical marijuana but surprisingly, lawmakers did not succeed in a close vote to make smoking lounges legal. However, cities in Colorado may do it. Denver has given authorization to lounges where consumers bring their own marijuana along. But so far, only a single permit has been awarded. Nevada puts a hold on the issue until next year and Oregon gave it consideration but ultimately rejected the legislation. Regulators in Alaska rejected onsite use last year but they will be visiting the issue again next month. It is a long time practice in San Francisco, for medical marijuana patients to smoke in marijuana dispensaries, though there was no certainty over whether the practice was authorized when the 1996 California voters made the state the first in the United States to legalize cannabis use with a doctor’s prescription. California sets the pace in a lot of aspects, especially industrialization. It is sure that the concept of having public facilities where medical and recreational cannabis can be used will proliferate. Weed is fully legal in California and a few other states. It is only a matter of time. The campaign will definitely produce positive results.